A website which planned to pay members of the public cash prizes for monitoring commercial CCTV footage online has had its launch delayed. The Information Commissioner's Office (ICO) stopped Internet Eyes operating fully while it investigates the plans. The ICO is making sure the site meets data protection laws, considering issues including training of staff and identification of people in footage. The company says it is willing to meet any requests set by the watchdog. The private company scheme intended to stream live footage to subscribers' home computers from CCTV cameras installed in shops and other businesses. 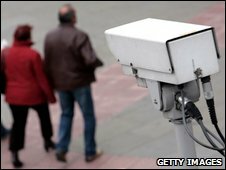 However, civil liberties campaigners had said the idea was "distasteful" in asking private citizens to spy on each other. Independent campaigning groups Privacy International and No CCTV said they had received a number of calls from worried members of the public, prompting the two organisations to complain to the ICO. Assistant information commissioner Jonathan Bamford said the ICO had told Internet Eyes that any organisation operating CCTV systems had to ensure they complied with the Data Protection Act. He said any images had to be used appropriately and those monitoring footage had to be trained. He said if such monitoring systems were in place to help "prevent and detect crime", the information should be provided to law enforcement agencies. He added that these same agencies were the only ones who should generally be allowed to release images to identify people when it came to criminal matters. He also said it was "not appropriate to disclose images of identifiable individuals for entertainment purposes or to place them on the internet". Internet Eyes sales and marketing manager Max Patey said the company had been in touch with the ICO on several occasions and had responded to all its concerns. He said: "We have always been aware that we have to abide by the laws in regards to data protection. "The ICO has been very kind to us and we will adhere by their suggestions." He said representatives met the ICO in December to discuss what the company had to do to be allowed to launch. Mr Bamford said: "The ICO is reviewing this response to assess whether the scheme complies with requirements of the Data Protection Act." Mr Patey said 13,390 people had already registered and were logged in but there was nothing for them to view at the moment due to the review. Last month, the site's managing director, Tony Morgan, told BBC's Inside Out London programme that it was not "a game" and that viewers would not know exactly which camera they were watching or where it was located. He said: "We are just rewarding people for their vigilance. "People are frightened to report incidents because if their curtain twitches - next thing they know there is a brick through the window."